This suit I had to round up to make it size 2. The main reason for this is so it could wield both weapons (I would've been fine with it being size 1 otherwise, but dakka is important). The 'mind' is essentially the guy inside the hardsuit. Since it doesn't physically fit a fig I bought it separately. 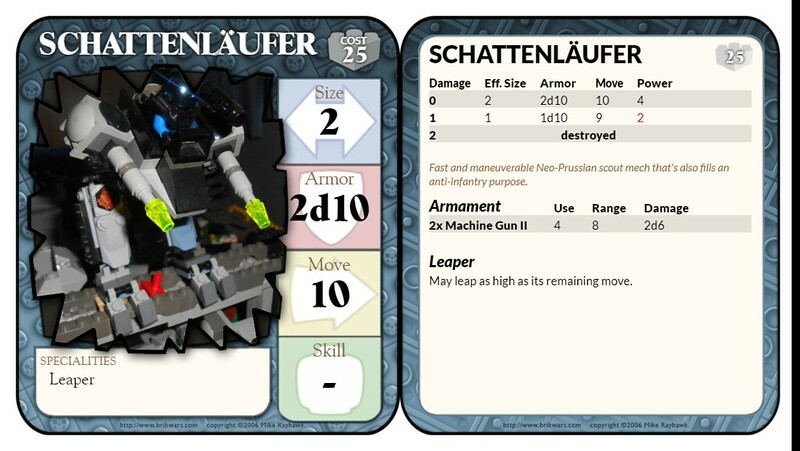 I gave it 1d10 armour (2d10 seemed to be pushing it considering I already had to round it up to get size 2) and armour plating to diversify it from the Schattenläufer, and also because it fits more thematically. 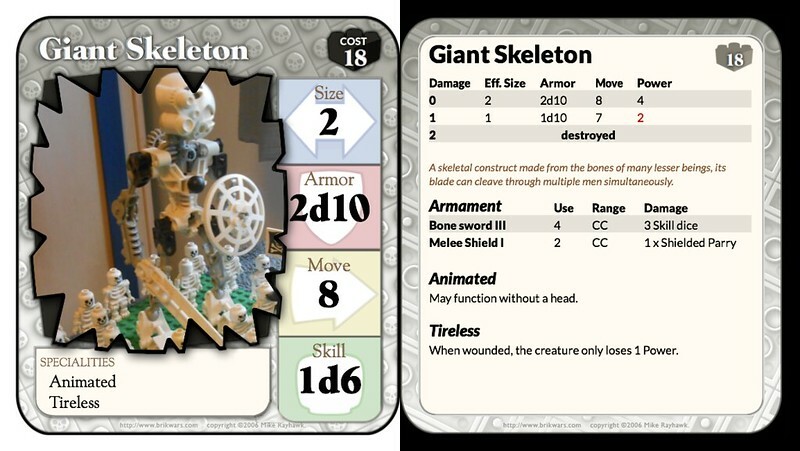 I believe it's also more 'cost efficient' for a size 2 creation since it loses the extra d10 armour after one hit anyway (cost efficiency with me is not about winning, just to be clear, but about being able to field as much cool stuff as possible). 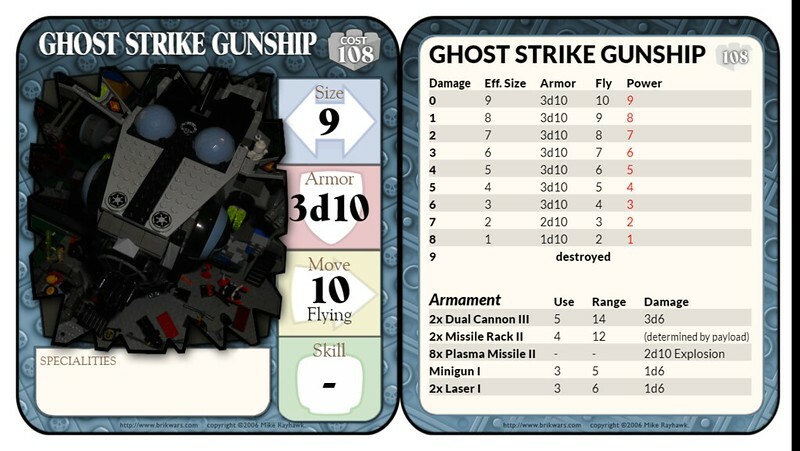 I think this will make it hard for regular infantry to kill it with pew pew laser pistols adding up damage while giving heavier weapons a good chance to kill it (which is what I'm going for). The unarmoured parts are the leg joints, the forearms and the head. Of course, they're hard to hit (-2) but a good shot could disarm, immobilize or outright kill it (no head = no mind). This one is pretty much by the book. I expect it to be more fragile than the Engel, and it also has a pilot that can get taken out, but it has the mobility to make up for it. The Machine Guns are something I look forward to using. This Leaper ability is free because to me it's a trade off for being able to get immobilized much easier than a vehicle with the traditional 4 wheels. I'm not sure about the Thrust movement here, but not sure if it really matters, either. I built these things before ever thinking about the stats I was giving them. I reduced some of the lasers in size. Looking back though, I could probably keep 4 of them Size 2 even if it exceeds the tank's power. If it's out of grenades (which it could be after 4 turns) that's 4 power worth of grenade launchers you're not using anymore anyway. But then again it's likely to have taken damage by that point already so it doesn't matter that much if you're not using all the power all the time. This one kinda gave me a headache. As a flyer, its power is limited. In the end I decided to give it more weapons than it could fire in one turn because versatility outweighs efficiency I think, especially as missiles become spent and the creation takes damage and you might be able to squeeze in a shot with a smaller gun that you otherwise wouldn't (or when you've taken a lot of damage and aren't able to fire the bigger guns at all). 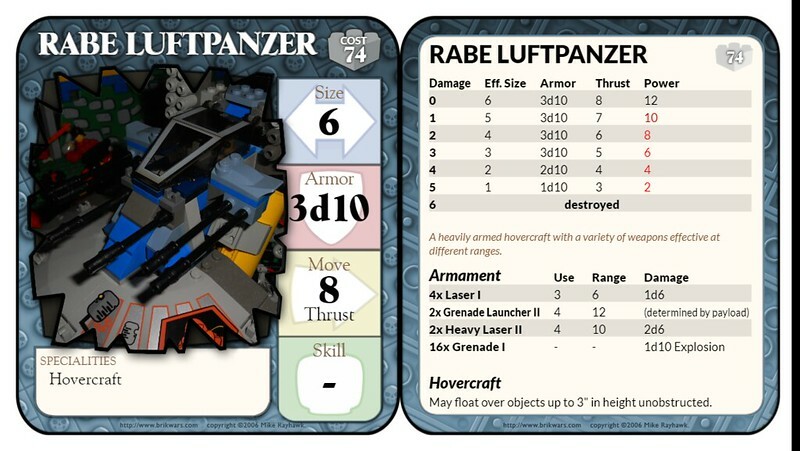 I guess I could also decrease the Auto Cannons (Size 3) to Heavy Lasers and put the bigger guns on some ground vehicle. When I built it those blue things on the top they were supposed to be energy shields, but with limited power available I don't think it needs them and it will push the cost too far over the top. So they just become integrated into the armour, I guess. The weapons exceed his power limit, but once he's shot his missiles he doesn't really have to care about that anymore since he can only shoot them once. 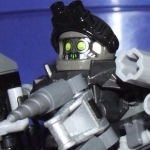 The Eye Laser and Hatch Gun are kinda necessary for covering the different angles (minifigs sneaking up behind it or jumping on top of its shoulders for example), the flame thrower I added simply because I wanted a big flamethrower one one of my MOCs. You could remove these three weapons to make him cheaper though, but with opponents liable to aim for weapon systems to disable them I don't think having a couple extra weapons is a bad thing. Made one for this thing as well. It seems good to me. I thought about giving it two SN dice but I want to see how it performs with 1 first. I'd say they all look pretty balanced. 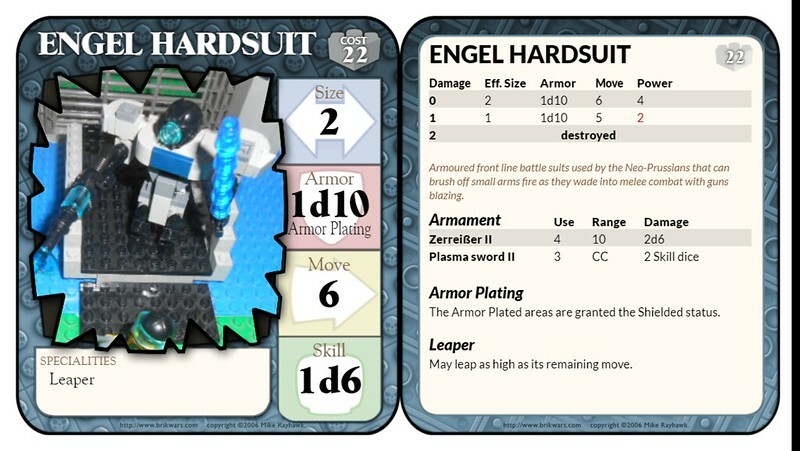 The only thing that seems a bit off to me is the Engel Hardsuit's ability to jump while having the armor plating that prevents a unit from jumping and flying. Then again, I guess that's why you'd made a separate specialization that states it actually can leap. Yeah it's supposed to be like a suit of power armour that actually makes you more mobile. I did keep its movement low so it wouldn't go too crazy. It's supposed to balance out the fact that you can disable a mech almost entirely by blowing one of its legs off. I do think I didn't set the right size for the armour. 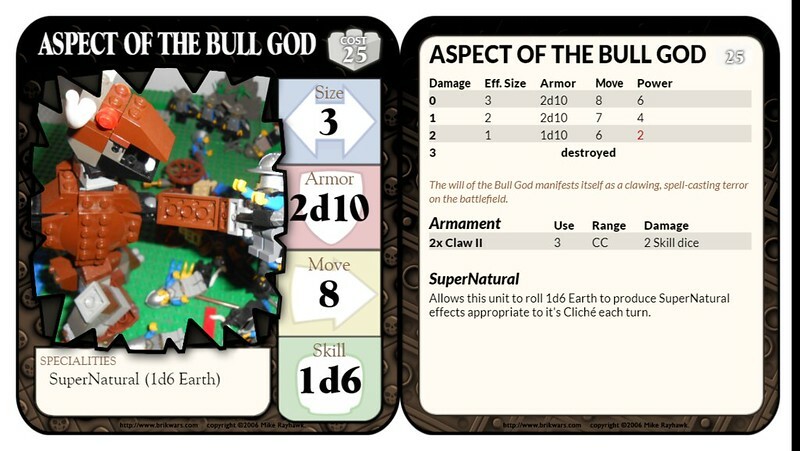 He started out as a regular hero and has since consumed Valarius' heart while Valarius was the Avatar of the Bull God (granting him the Demon Form), consumed the energies of the Falx Portal (granting him the extra armour) and absorbed (part of) the necrotic energies of the Amplifier while he was in Northeros (giving him extra skill), which is why he has such high stats. 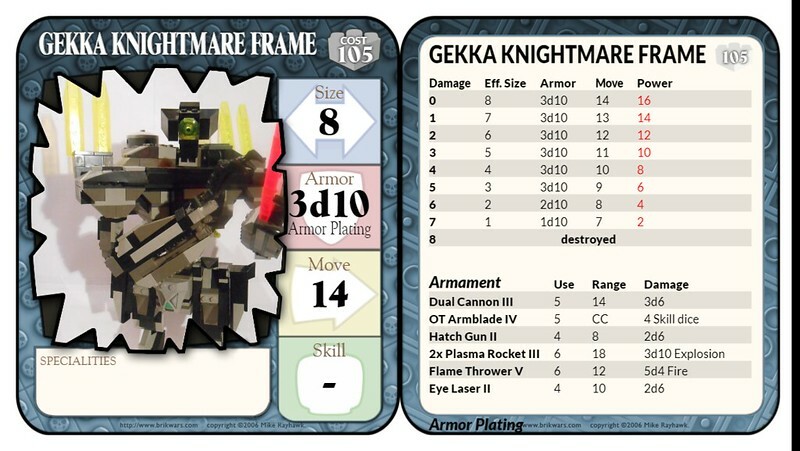 His high stats come at a price though - I'm pretty sure a regular hero would be more cost efficient, and heroes are still the most prone to catastrophic failure no matter how good you make them so I'm pretty sure in an equal CP fight he wouldn't be your best bet. 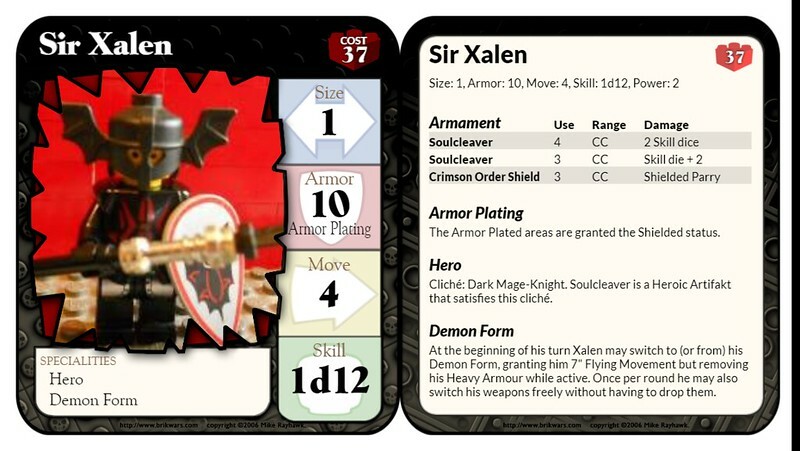 Demon Form for example costs 9 CP: Cost of the flying movement (14) minus cost of the armor (2) and regular move (4) which he doesn't use in this form plus 1 CP for the ability to switch weapons. Being able to switch between weapons is also useful but you don't get the 'raw' benefit from the extra CP since he can only use one form or one weapon at the same time. I kinda messed this up and made it cost 11 so his cost should really be 35. Not that it matters much. I considered giving him SN dice or extra HP instead of the stat boosts but I'm going to see how this works first 'cos I'm still experimenting with SN dice and I kinda stopped using HP for heroes. I agree in regards to cost efficiency. One question though: why give him hard-locked 10 points of armor? Kind of the same reason regular minifigs tend to have 4 armour. I could give him 2d6+2 but locked armour values save me some time. If playing against people in real life I would favour dice rolls though 'cos of the potentially hilarious randomness that could occur and tension of the moment, but this is made for forum battles. The Armour Piercing ability is free since it'd be the same as them having a spear or axe which they could actually grab with two hands. Acrobatix I only gave 0.5 CP cost 'cos it's so situational. 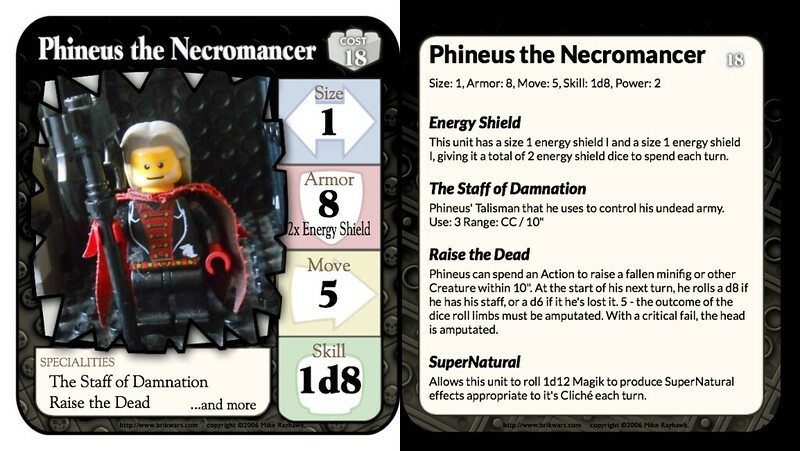 Phineus was originally just a Hero with the Necromancer cliché, but I took my time to create a more unique character. Raise the Dead is his version of Ker-Triage! but with 1 CP extra cost thanks to the range. I didn't find a CP or power cost for staffs and assumed the 'price' you pay for them is simply the fact you can't wield other weapons. I might be wrong though. 2010 rulebook says it's 2CP. Oh, he's 20 CP then... Thanks. 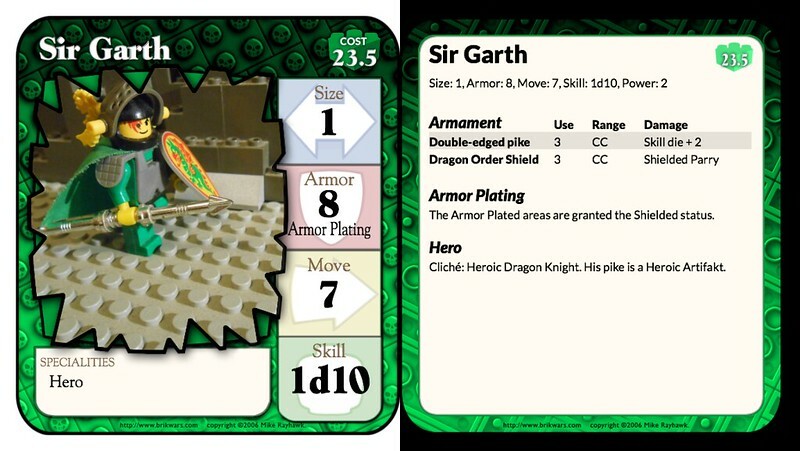 The next stat card I have is Garth. 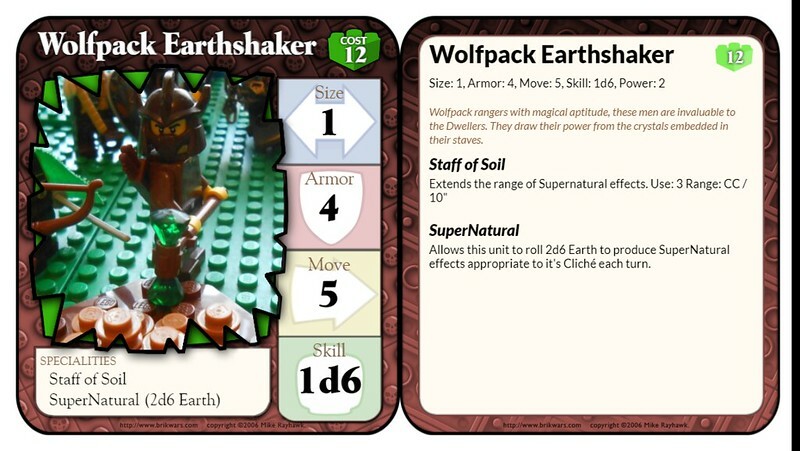 He's pretty standard, apart from his movement, which is quite a big deal for an armoured hero (I remember it being a real bother for Valarius that he could only move 3,5" in The Arktifakt), especially because he can charge. 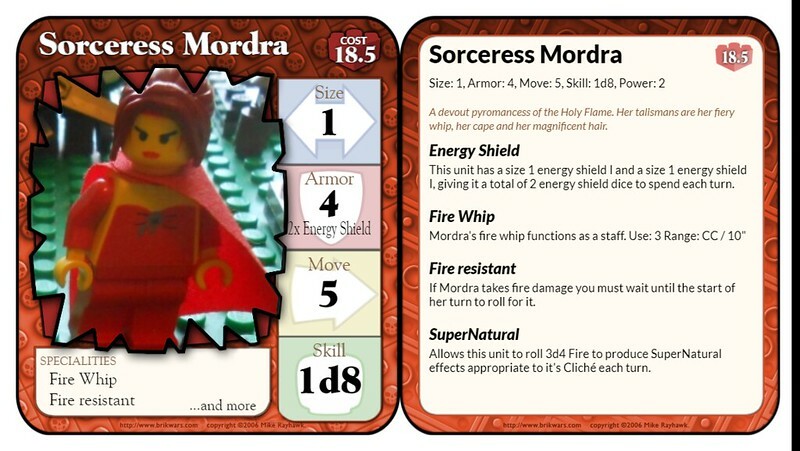 Stat card for Mordra. Instead of making her a Hero with some unique perks I decided to make her a buffed SN character. 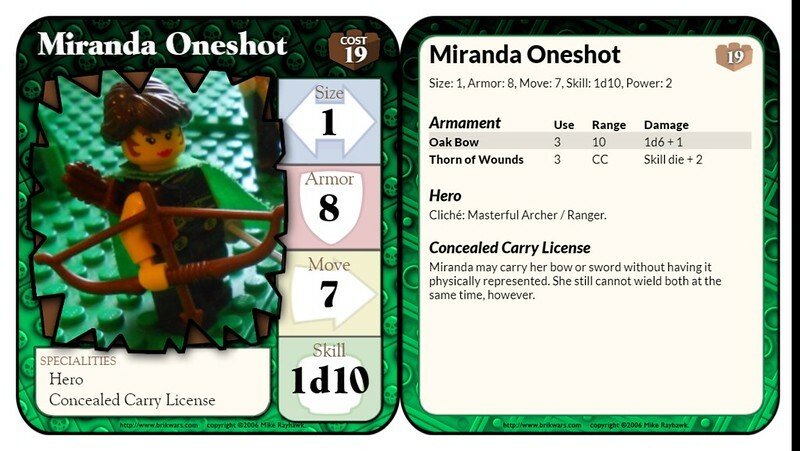 The idea behind the fire resistance is that fire damage isn't likely to kill her, but will most likely force her to use some of her SN dice to put out the fire on her next turn. I misinterpreted the working of energy shields while making this, thinking they could only grant deflection against d6's of damage. But apparently they can block anything. Woops. Well, energy shields quickly run out and she has low armour (unless she chooses to buff it with her SN dice) so I don't think she'll be too crazy. This guy has basic stats according to the rules. For the special characters to shine others have to be more standard. Same goes for Miranda. Standard apart from the Concealed Carry License (which is free, I could go stuffing the sword into the cape or underneath the quiver if I really wanted to but it limits her pose-ability and might damage the parts). 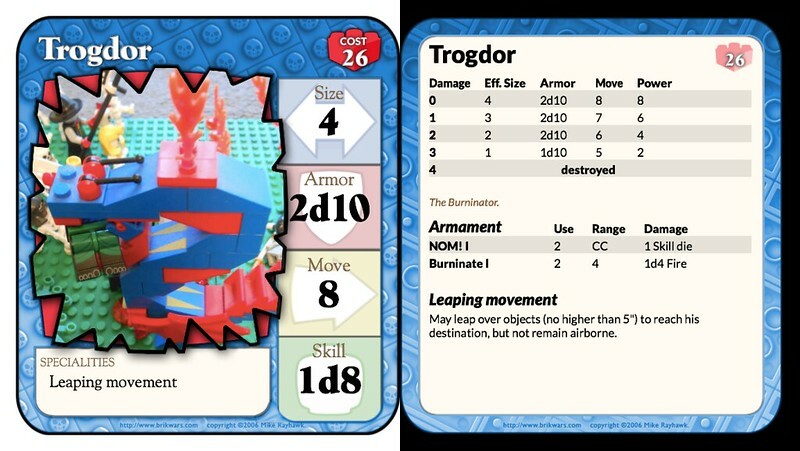 The Trogdor! He doesn't have big weapons, but with 1d8 skill he's still a good unit killer, so long as said unit doesn't have deflection or armour. He can also keep using both his weapons until he's destroyed, which is pretty efficient. The damage over time of fire makes even the size 1 flamethrower a good weapon, I think. 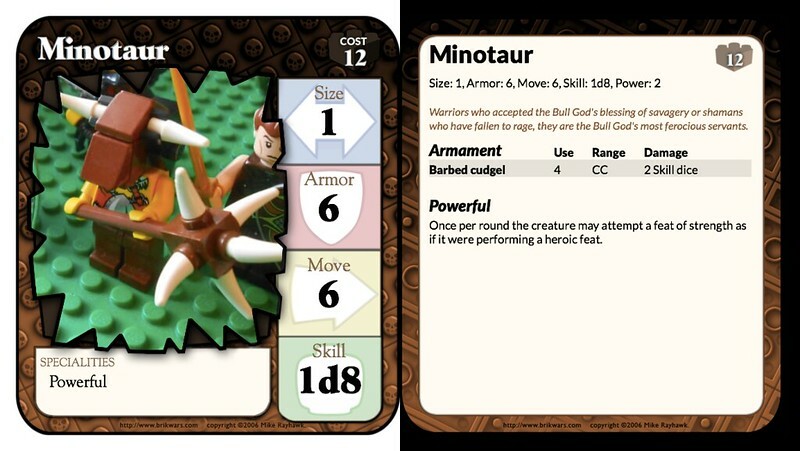 The minotaur is a one-of-a-kind and like a minor hero. I was gonna give him a heavy weapon at first but then remembered units with shields would have a pretty easy time resisting him if I did that, so I made his weapon two-handed instead. Although... now that I think about it, he can ignore a level of deflection anyway using two-handed swings. Oh well, more carnage > cost efficiency I guess. 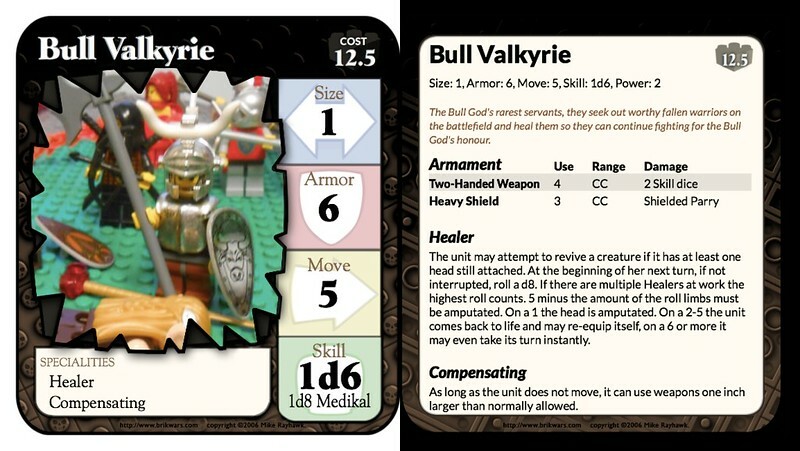 Being a heavy and a healer at the same time might split the Valkyrie's abilities a bit, but I really wanted her to have that iconic Bull phalanx look so she would fit in well with the rest of 'em. Two custom abilities, one to make it so it can still use its sword after taking a point of damage (otherwise it would be pretty useless). This guy is pretty powerful. The armoured status is meant to reflect that his body simple absorbs most attacks, 'cos obviously he's not literally armoured. I had to give him a weakness so it's being slow, thanks to his stubby legs. The regeneration costs 4 CP and I 'nerfed' it to only generating 2 size 10 explosives. It'll probably generate a lot more value than 4 CP but if he's taking damage staying still and not taking an action is risky at best, and he's slow so he can't get away from any attackers to kite them until the end of days either. 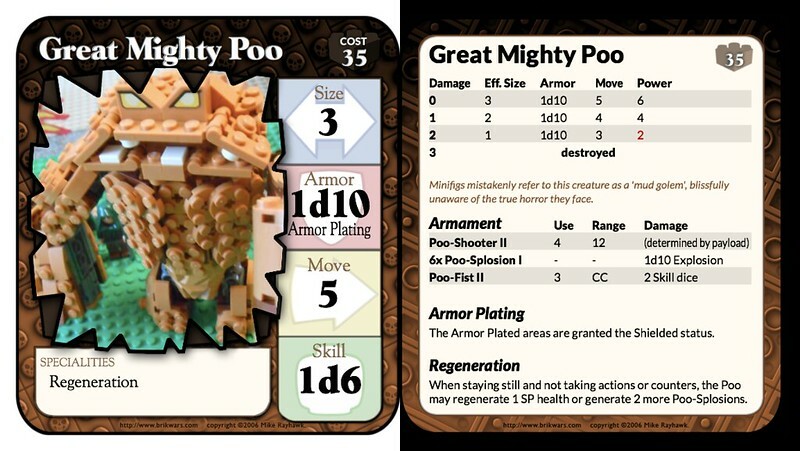 Didn't know Poo had an armor plating. Also, quick question about the poo-launcher: is it intentional, that in Depths of Darkness this size 2 launcher can only shoot one size 1 explosive at a time? 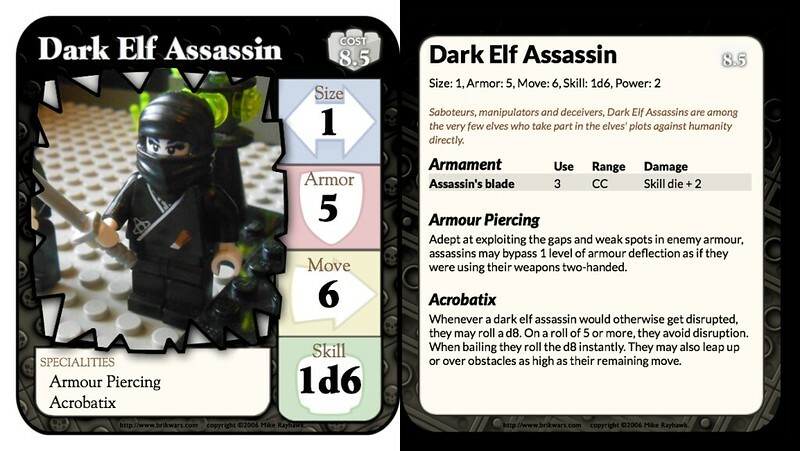 I gave him 2d10 initially but I changed it as I was putting together the stat card. Last round I definitely had him shoot twice, it's a pretty major strength of his that he can do that, and at such long range, so if I only had him shoot once before it was either a mistake or because of other reasons, like killing his target in the first shot (shooting at two separate targets would require an extra mind if I'm not mistaken).